PHPI talks with Martin Jones, Managing Director of TradeHelp, to find out more about the app designed for trade professionals and its recent venture into the bathroom arena. The TradeHelp network has grown considerably over the past year or so. What do you believe you offer over and above similar propositions that is driving installers to sign up? Martin Jones (MJ): TradeHelp boasts two unique selling points and I believe it’s these, along with the extensive capability of the app, which have led to the seven-fold growth we have experienced over the past year. Firstly, the TradeHelp Buying Group network allows us to engage with manufacturers and merchants to negotiate cash back from 15 leading manufacturers, and special terms on over 50,000 products from national merchants. Secondly – thanks to the support from these manufacturer and merchant partners – we don’t need to charge installers anything for our benefits. How much does the app cost to download and use? MJ: The app is free to download and use from the App Store or Google Play. Along with quick quotes and invoices, customer and appointment management, a comprehensive toolbox and electronic forms, it’s also the gateway to the other TradeHelp benefits, including the Buying Group and multiple payment options. Installers can download and use our handy app tools, make hundreds of pounds of savings annually through the Buying Group and offer interest free credit to their customers – all at no cost. You recently expanded into the bathrooms sector and have plans to broaden the concept to other trades. Will this be an extension of the existing app or will there be standalone versions for each trade? 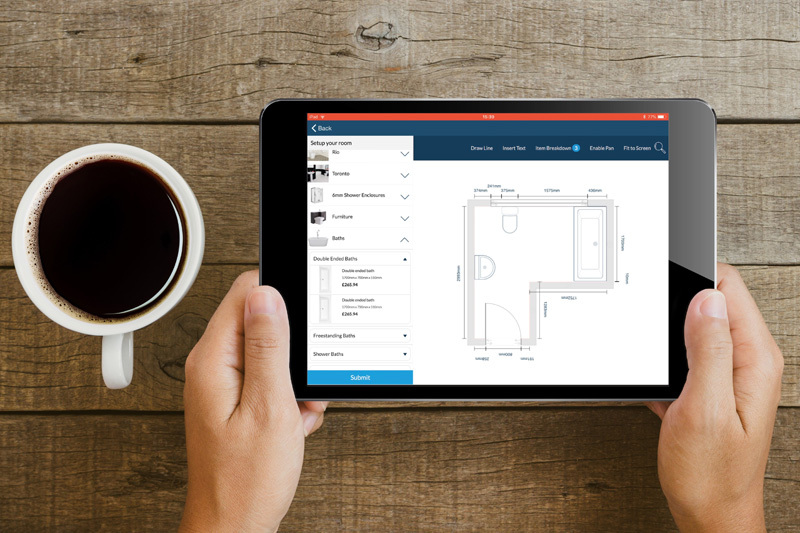 MJ: A bathroom quote tool with bathroom design software launched in November last year and has been very well received. Still free to use, it creates a professional quote with an optional personalised room plan in minutes, and all from the customer’s home. The future will certainly see us broadening our offer even further and an electrical concept will be launched later in the year. To keep things simple, there will be just one TradeHelp app to download, with an option to select specific trade(s) in the sign up, in order to ensure all the relevant benefits are displayed to each installer. How does the interest-free credit element work from an installer’s perspective? MJ: Installers can advertise interest free credit to their customers and no consumer credit licence is required. A simple process in the app allows them to create a professional finance quote and TradeHelp takes care of the whole application from there. Once the installation is complete, the signing of an electronic satisfaction note in the app closes the job and the installer is paid. We charge nothing to carry out one ‘over the phone’ training session, there are no setup fees or monthly costs and a TradeHelp admin fee of 5% is only deducted from the seventh successful installation onwards. The process is aimed at smaller installers, to give them the opportunity to test a finance offering in their area. All installers are then welcome to apply to become a TradeHelp Introducer Appointed Representative to offer interest bearing credit over one –10 years at no additional cost. Are there any plans to enhance the app within the heating sector? MJ: Development of the app has not stopped since its launch in 2017, with continuous improvements being made to keep us ahead in the industry. We have recently launched new oil forms, a service reminder function and an even quicker solution to quoting on the go. A section dedicated to the Buying Group is the major new function which provides the installer with a dashboard detailing their savings through the network to date, updates on claims that have been made and cashback they are about to receive, plus special offers and incentives to access further rewards. The ever-increasing buying power of the group is attracting more and more support with new supply chain partners being announced on a regular basis. It’s a great time to become part of the TradeHelp Network!